Gladys Del Fierro was born in Brownsville, Texas and raised in San Antonio, Texas. After graduating as Valedictorian from an all-girl private high school, she went on to serve as President of her college sorority, Alpha Phi International Fraternity. In 1997, Ms. Del Fierro graduated from St. Mary's University and received a Bachelor of Business Administration in Accounting. Immediately following graduation, Ms. Del Fierro attended law school at St. Mary's University School of Law and was on the Dean's List. In addition, Ms. Del Fierro became a member of the Phi Delta Phi Legal Fraternity. 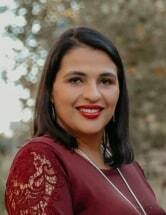 After graduating from law school in 2000, Ms. Del Fierro opened her private law practice in San Antonio, Texas where she practiced primarily in the areas of Family Law, Criminal Defense and Personal Injury. In 2005, Gladys Del Fierro and Daniel Vela formed the law firm, Vela & Del Fierro, PLLC where she has been a managing partner to date. The firm focuses primarily on Family Law, State and Federal Criminal Defense and Personal Injury. Ms. Del Fierro is currently licensed to practice law by the State Bar of Texas and the United States Western District. She is also a member of the Texas Criminal Defense Lawyers Association, the Family Law Section of the State Bar of Texas and the San Antonio Criminal Defense Lawyers Association.